The Chinese Yuan (also called the Renminbi) attempted a recovery in its opening move of this past week, but the currency would ultimately end back up on the cusp of 12-month lows against its US counterpart. No doubt risk trends played a significant role in this failed attempt at liftoff. With global equities on the lam, the frequent financial headlines lamenting China’s slowing growth, impending wave of defaults and asset bubbles are taken more seriously. Will the international market’s scrutiny increase this week as speculators come under pressure? Will heavy economic docket alter the Yuan’s position on the global scale? 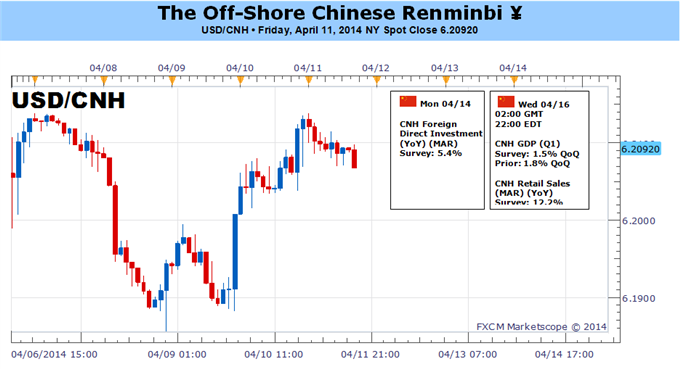 These are the question we should ask to determine whether USDCNH will mark its break above 6.2500 or below 6.1750. Historically speaking, USDCNH maintains a strong negative correlation to the S&P 500. In other words, the Chinese currency has risen consistently alongside the ‘risk trends’. Fundamentally, this makes sense. Investors seeking higher return on their capital put their money to work in China where relative returns mirrors the country’s astounding growth rate. Naturally, when the tide goes back out on sentiment, funds are repatriated to seek stability. However, the situation is a little more unique with China. First and foremost, there is an issue with the scale of risk aversion. While we have seen genuine stumbles in exuberance these past years, we haven’t seen anything on the scale that would shake highly leveraged positions nor the less liquid investments in China. To turn the Yuan into a more sensitive emerging market currency (like the South African Rand, Brazilian Real or Indonesian Rupiah), we need to see a greater sense of conviction. Another unusual aspect that has kept this pair from deviating from its long-term depreciation (Yuan gain) are the external controls – and the speculative distortion that has. The PBoC sets the USDCNY reference every day and doesn’t allow fluctuation greater than 2 percent around its band. Under the assumption that Chinese authorities will continue to loosen the exchange rate as it approaches ‘fair value’, investors feel particularly confident about investing in the country expecting stability. That has led to what many call the ‘China Carry Trade’. Yet, debt defaults, asset bubbles and curbs on capital outflow can quickly work against those same investors. A more traditional route to volatility – event risk – may be tempted in the week ahead. China’s calendar is dotted with foreign reserves, lending, foreign direct investment (all without specific days for release) as well as precisely timed business activity, fixed assets, retail sales and industrial production figures for March. However, the big ticket item will certainly be the first quarter (1Q) GDP report. The consensus is for the country’s pace of growth to slow from 7.7 percent in the final months of 2013 to 7.3 percent. The Premier and Central Bank Governor have both said that would be within the tolerable band, but will investors be so confident as defaults mount and officials deny fresh rounds of stimulus? Gold is up 1.1% on the week with the precious metal trading at $1318 ahead of the New York Close on Friday. The rally comes on the back of a substantial sell-off in broader risk assets with US stock indices off by 2-3% across the board. Gold prices have found support on risk-aversion flows and Fed rhetoric after coming off seven week lows at $1277. The advances are likely to remain limited however as the technical picture keeps the broader focus weighted to the downside. Interest rate expectations were subsequently pushed out, offering support for bullion as the greenback came under tremendous pressure. 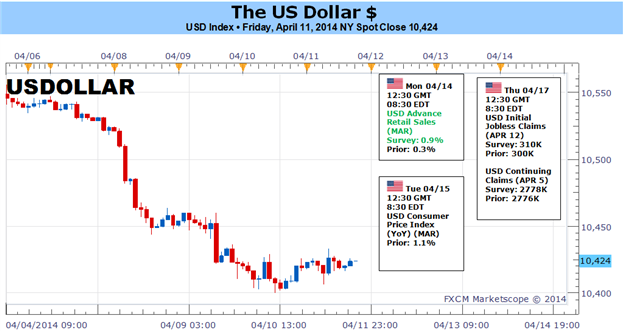 The Dow Jones FXCM Dollar Index (Ticker: USDOLLAR) fell to levels not seen since October with a decline of more than 1.2% heading into the close of the week. However, with the US docket picking up next week, the greenback may find some support, limiting the fuel needed to sustain the gold rally. Traders will be closely eyeing key US data prints next week including retail sales, the consumer price index (CPI), housing data and the release of the Fed’s Beige Book. Inflation data on Tuesday is expected to show a n increase in the pace of year on year price growth to 1.4% from 1.1% with core and m/m inflation expected to hold steady at 1.6% and 0.1% respectively. The updated assessment of the Fed’s twelve districts on Wednesday will likely highlight the week’s docket as investors look for signs that the recovery remains on firm footing. From a technical standpoint, gold remains at risk below the March opening range low at $1327, with only a move surpassing $1348 shifting our focus back to the topside. This level represents the 61.8% retracement of the decline off the March highs and would require a breach back above the 2012 trendline resistance we broke last month. Bottom line: we’ll be looking for short triggers next week to offer favorable entries targeting objectives into $1270 with only a breach/close above $1327 invalidating our medium-term bias. Such a scenario eyes a break above $1348 to put resistance objectives at $1366, $1383 and $1408 in view. 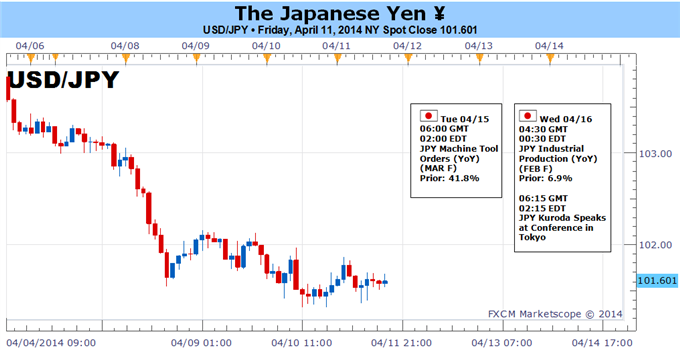 What’s the Risk of a Much Larger Japanese Yen Breakout? The Japanese Yen surged against major forex counterparts as the S&P 500 and Japanese Nikkei 225 tumbled. A rush to safety favored the JPY, and the fact that it trades at critical resistance (USDJPY support) suggests the week ahead could bring further volatility. Japanese equities bore the brunt of the global shift towards safe-haven assets as the Nikkei posted its single-largest weekly decline in three years. The highly-correlated Dollar/Yen exchange rate looks especially at risk if the Nikkei falls to further lows. Sharp domestic equity underperformance can partly be blamed on a disappointing Bank of Japan monetary policy announcement. Central bankers left the current pace of Quantitative Easing purchases unchanged, and surprisingly hawkish rhetoric from BoJ Governor Kuroda sunk hopes that they would ease policy further. To that end it will be important to monitor commentary from the BoJ chief this week; we suspect that Nikkei weakness and JPY surges would likely soften the bank’s stance on further QE. Similarly surprising commentary from the US Federal Reserve put further pressure on the US Dollar/Yen exchange rate in particular. Minutes from the recent Federal Open Market Committee meeting showed that several members believed interest rates would rise more gradually than staff projections predicted. The effect on US interest rate futures was clear: implied yields for the December, 2015 interest rate futures fell to their lowest since the USD traded to ¥101.20 just one month ago. There’s certainly risk that this may be the start of a larger USDJPY breakdown and Japanese Yen break higher. Yet it’s important to note that FX options show volatility prices remain near multi-year lows. In plain words: traders aren’t necessarily betting on/hedging against much larger USD moves. Until we see a more significant shift in FX market conditions it’s difficult to argue for a much larger JPY break higher (USDJPY breakdown). Yet it would be foolish to ignore the clear risk that the Nikkei 225 could fall further, and clear pressure on US interest rates could likewise keep the Dollar under pressure through the days and weeks ahead. Last edited by 1Finance; 04-12-2014 at 06:34 AM. The British Pound struggled to hold above the 1.6800 handle after failing to clear the February high (1.6821), but the fundamental developments coming out next week may generate fresh highs in the GBP/USD as the economic recovery in the U.K. gathers pace. Even though the International Monetary Fund (IMF) lowered its global growth forecast for 2014, the group sees the U.K. outpacing the other advanced economies as the region is now expected to grow an annualized 2.9% this year, and the Bank of England (BoE) may come under increased pressure to normalize monetary policy sooner rather than later as U.K. Jobless Claims are projected to contract another 30.0K in March, while wage growth is anticipated to pick-up for the third consecutive month in February. With that said, the U.K. Core Consumer Price Index may continue to highlight sticky inflation in the U.K. amid the ongoing pickup in economic activity, and Governor Mark Carney may do little to halt the ongoing appreciation in the British Pound as it helps the Monetary Policy Committee (MPC) to achieve the 2% target for price growth. In turn, the BoE Minutes due out on April 23 may sound more hawkish this time around, and a further shift in the policy outlook may heighten the bullish sentiment surrounding the sterling as the central bank moves away from its easing cycle. As a result, we will continue to look for opportunities to ‘buy dips’ in the British Pound, and the GBP/USD may continue to carve a series of higher highs & higher lows this year as it retains the bullish trend carried over from 2013. The next topside objective for the GBP/USD comes in around 1.6850-60, the 78.6% Fibonacci expansion from the October advance, and we will continue look for a higher high as it carves a higher low earlier this month. Last edited by 1Finance; 04-12-2014 at 06:40 AM. The dollar has suffered. A 1.1 percent tumble through the past week marks the currency’s worst performance since October 18 – notably, when the greenback bottomed out a three-month slide. On the verge of a stark trend change on a individual basis (the Dow Jones FXCM Dollar Index is standing just above a mulit-year trendline and 12-month range low around 10,400) and its important pairings (EURUSD close to 1.4000, GBPUSD at four-year highs and USDJPY looking heavy above 100), the potential for a crippling collapse or dramatic recovery is tangible. Bears will point to the recent slide in Treasury yields and rate expectations as their cue for the next leg. Bulls see the tumble in capital markets last week as the currency’s salvation. What we find is likely something in the middle…and perhaps still bullish. While FX markets carved hefty moves and tested serious levels, the top financial headline of this past week was the drop in equities. In particular, the S&P 500’s 2.6 percent slide through the period was the benchmark’s worst since the period ending June 1, 2012. 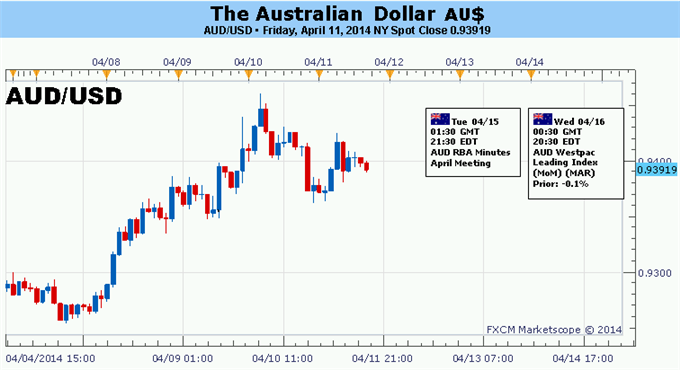 In this move, there is the potential for dollar’s salvation – though it isn’t especially high. This benchmark for risk appetite is down 4 percent from the record high set last Friday. For many, such an abrupt move translates into substantial ‘risk aversion’. If there is enough ‘fear’ in this correction such that it infects the broader financial system, the dollar could regain its traction amid a scramble for liquidity. The difficulty in turning this recent volatility swell into a lever for the dollar is the balance of conviction. To tap the currency’s unique safe haven status, we need the level of speculative unwind that redirects investors from higher yields in the Eurozone, China and the UK to the deep markets and regulations of the US. That is easier said than done. 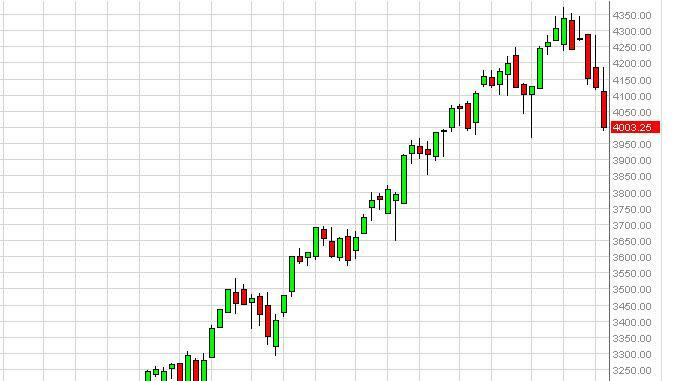 There have been plenty of temporary corrections during the past 5-year dominant bull trend that have petered out and inevitably acted as a spring board for opportunistic speculators. Such consistency has led to an extraordinary sense of complacency and certainty. Whether we are looking at the bigger picture from a technical view (record high stocks), a fundamental view (high valuations) or structural view (excessive leverage); the potential for a ‘cleansing fire’ is high. The risk that it happens over the coming weeks or months is higher now than it has been in the past years, but it will be particularly difficult to generate the kind of panic that revives the dollar’s safe haven status this week. For one, there are few events that tout the kind of influence necessary to single-handedly redefine sentiment. Perhaps more a burden is that the trading ranks will be severely thinned out by a market holiday for much of the western world on Friday. It is important to maintain a healthy sense of skepticism for scenarios that are low probability – especially those that we desire for more favorable trading conditions – but it is just as important to have a plan in place should they be realized. If we do manage to see sentiment ignite in flames, the dollar would do more than bounce – it would surge. A more engaged fundamental theme for FX traders to keep track of this week is the development in interest rate forecasts. The greenback’s tumble these past three months – and particularly the past week – have been heavily influenced by a substantial corrosion in rate forecasts. From a time frame as competitive as early as 1Q 2015, the market is conforming to the mid-2015 by the Fed. This has led to a drop in Treasury yields and market rates – and the dollar in turn. Yet, while the USDollar stands on the cusp of a major trendline break, it is important to differentiate a loss of premium from an actual dovish turn for US forecasts. The latter could sink the greenback, but that is not the circumstances we are working with. The question is how far the premium retreat goes. Does it end this week with March CPI and Fed Chair Yellen speeches or does it continue to weigh? Be ready. The Australian Dollar continued to recover last week, finishing Friday’s session with the highest close in five months against its US counterpart. The move tracked a pickup in RBA interest rate hike expectations, with a Credit Suisse gauge tracking the priced-in outlook now at levels unseen since November and pointing to an interest rate hike within 12 months. A hefty helping of top-tier Chinese economic data may undermine Aussie strength in the week ahead however. The first quarter GDP report takes top billing, with expectations pointing to a slowdown to 7.3 percent on the year-on-year growth rate. That would mark the weakest pace of expansion since the Great Recession trough recorded in March 2009. Softening retail sales and industrial production readings are likewise on tap. Data from Citigroup shows Chinese economic news-flow has increasingly underperformed relative to consensus forecasts since mid-February. Indeed, the gap between expectations and realized outcomes is now at its most dramatic in five years. That suggests analysts continue to underestimate the extent of the slowdown in the world’s second-largest economy, opening the door for disappointing outcomes. China is Australia’s largest trading partner. That means that a slowdown in the East Asian giant may spill over into Australia via ebbing cross-border demand, undermining the case for RBA tightening. Needless to say, that bodes ill for the Aussie Dollar. The release of minutes from April’s monetary policy meeting where Governor Glenn Stevens and company once again argued in favor of a period of stability in baseline rates may further temper hawkish bets. On the external front, a busy docket of scheduled commentary from Federal Reserve officials including Chair Yellen as well as the release of the central bank’s Beige Book survey of regional economic conditions may prove market-moving. AUD/USD has moved closely in line with the Australia-US front-end bond yield spread. If last week’s disappointment in minutes from March’s FOMC minutes is softened by supportive outcomes on these fronts, a pro-taper shift in policy bets may likewise put pressure on the Aussie. Last edited by 1Finance; 04-12-2014 at 06:56 AM. The US dollar had a terrible week, falling across the board. Can it stabilize now, or will the sell off continue? US retail sales, German ZEW Economic Sentiment, US Inflation data, Janet Yellen and US Haruhiko Kuroda speeches, Unemployment Claims and the Philly Fed Manufacturing Index are the highlights of this week. Here is an outlook on the main market movers coming our way. US Retail sales: Monday, 13:30. U.S. retail sales expanded more than expected in February, after harsh weather conditions slowed activity in recent months. Retail sales edged up 0.3%, following a revised 0.6% decline in January. The reading was higher than the 0.2% rise anticipated. Meanwhile Core sales, excluding automobiles, gasoline, building materials and food services increased 0.3% after a 0.3% decline in the previous month. Analysts anticipate retail sales would improve further in the coming months. U.S. retail sales are expected to rise 0.8%, while core sales are predicted to gain 0.5%. UK inflation data: Tuesday, 9:30. The UK inflation rate fell to a four-year low of 1.7% in February, amid a sharp decline of 0.8% in petrol prices. This was the second consecutive reading falling below the BOE’s 2% inflation target. Prime Minister David Cameron noted that the figures support the government’s economic strategy to provide stability and security for hard-working people. But Labour’s Shadow Treasury Minister Catherine McKinnell said prices are still rising faster than wages badly affecting household consumption. CPI is expected to rise 1.6%. German ZEW Economic Sentiment: Tuesday, 10:00. Investor sentiment in Germany continued to decline in March, falling for the third consecutive month to 46.6 points, from 55.7 in February. The release came in below forecasts of a 52.8 points reading. The possible reasons for this weak reading could be, a softer outlook for emerging market activity, a strong euro and mounting deflation risks and tensions in the Ukraine. Investor climate is expected to reach 46.3. US Inflation data: Tuesday, 13:30. U.S. inflation stayed mild in February. Consumer Price Index inched 0.1% for the second month consecutive month after a drop in gasoline prices offset the largest rise in the cost of food in nearly 2-1/2 years. On a yearly base, consumer prices increased only 1.1%, weaker than the 1.6% rise in January. Meanwhile Core prices, excluding volatile energy and food components increased 0.1% for a third straight month and remained steady at 1.6% on a yearly base. However, the stable state of inflation is positive for business planning for hiring and capital spending. Both CPI and Core CPI are expected to gain 0.1%. Janet Yellen speaks: Tuesday, 13:45, Wednesday 17:15. Federal Reserve Chair Janet Yellen will speak in Stone Mountain and in New York. Yellen may speak about the recent improvement in the US job market as well as the ongoing tapering process, its duration and its effects on the US economy. Volatility is expected, especially after her previous important comment triggered a big USD rally. UK employment data: Wednesday, 9:30. The UK’ unemployment rate remained stable at 7.2% for the third consecutive month, however, the number of people claiming unemployment benefits declined more than expected, reaching 34,600, indicating the labor market continues to improve. The BoE revised its forward guidance policy, which linked interest rate decisions to the unemployment rate, since the rate fell unexpectedly towards the 7%, marking the start of rate hikes. The Bank hinted that the first rate hike will occur in the second quarter of 2015. UK number of unemployed is expected to decline by 30,200, while the unemployment rate is expected to remain 7.2%. US Building Permits: Wednesday, 13:30. The number of building permits surged in February to 1.018 million units from January’s total of 945,000. These four-month high topped analysts’ predictions for 970,000 units. Contrary to this release, U.S. housing starts declined by 0.2% in February a seasonally adjusted 907,000 units from January’s total of 909,000, disappointing expectations for an increase of 3.4% to 910,000 units. Nevertheless the rise in the number of permits ensures the continuation of growth in the housing industry. The number of building permits is expected to reach 1 million. Canadian rate decision: Wednesday, 15:00. The Bank of Canada was concerned about the soft inflation rate on its last meeting in March, despite the rise in consumer prices occurred in January. The bank noted that a rate change is possible in the next policy meeting however analysts do not expect a rate change until the third quarter of 2015. The rate report was nearly unchanged from January when Governor Stephen Poloz said the door was “slightly more open to a rate cut. Meanwhile, the Canadian dollar, dipped in value against its U.S. counterpart in recent months which may help to boost exports, business confidence and investment. Interest rates are expected to remain unchanged at 1.00%. Canadian inflation data: Thursday, 13:30. Canadian consumer prices edged up 0.8% in February, following a 0.3% rise in the previous month. The rise was better than the 0.6% predicted by analysts. However, on a yearly base, the index dropped to 1.1% from 1.5% in January. Canadian Core prices rose 0.7% while expected to reach 0.5%. The year-over-year core rate moderated to 1.2% from 1.4% in January. The sharp rise indicates that seasonal factors were involved. However, despite the recent increase, inflation remains rather tame. CPI is expected to edge up 0.4% and Core CPi is expected to increase by 0.3%. US Unemployment Claims: Thursday, 13:30. The number of Americans filing initial claims for unemployment benefits dropped sharply last week to the lowest level since December 2013, reaching 300,000, signaling a pick-up in the US job market. Positive weather and stronger growth boosted the labor market causing the 32,000 drop. This stronger than expected release will also contribute to the second quarter growth rate. Unemployment claims are expected to increase to 316,000. US Philly Fed Manufacturing Index: Thursday, 15:00. Manufacturing activity in the Philadelphia-region soared in March, reaching 9 points after posting minus 6.3 in February, easing concerns over the U.S. economic outlook. Analysts had forecasted the index to rise to 4.2 in March. The survey’s showed new orders, and shipments increased and recorded positive readings indicating growth trend is returning following weather-related weakness in February. Manufacturing activity is expected to improve further to 9.6 points. 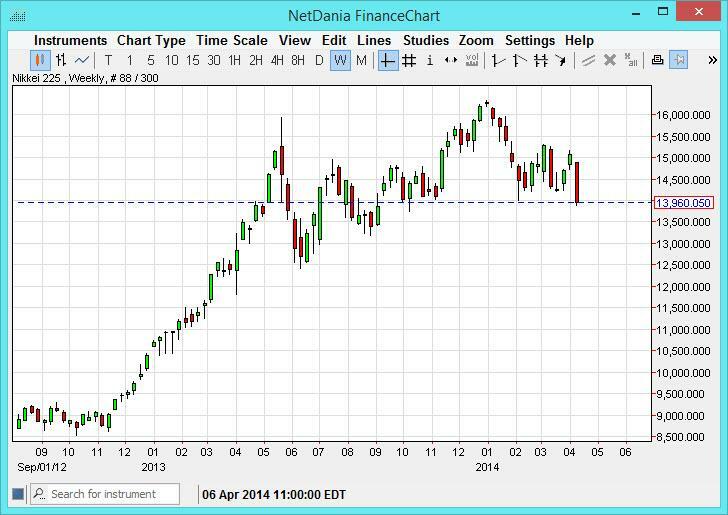 The Nikkei as you can see fell during the totality of the week, closing below the ¥14,000 level. However, there is a significant amount of support below this level as well, and therefore we are not quite ready to start selling. This area could produce a supportive candle, and we would be willing to take a supportive candle on either the daily or weekly chart, as we believe ultimately this market will test the ¥16,000 level yet again as the uptrend should continue. Selling is not an option at this moment. 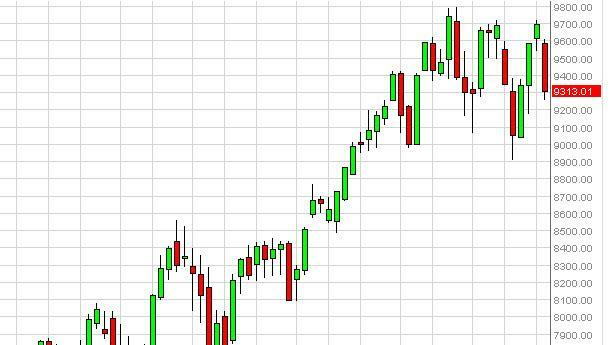 The DAX as you can see fell hard during the week, closing near the €9300 level. This of course is a very bearish candle and we believe that the market may very well continue lower from here, especially considering that there was a gap on Friday. The €9000 level has been very supportive in the past, and because of that we think that a supportive candle in that general region would be perfect for a buy signal. It doesn’t have to be on the weekly chart, it can be on the daily chart as well, but either way we would be very interested in buying in that area. The NASDAQ as you can see initially try to rally during the week, but found enough resistance at the 4200 level, sending the market much lower. We found the 4000 level supportive though, as one would expect. The end of the day on Friday saw the market stopped, and as a result we think that this market will more than likely find a supportive candle in this region. We are more than willing to buy a supportive candle in this region, but recognize that closing at the bottom of the range suggests that we probably have a little bit of selling to do still.